Modern people leadership (that is, leading a team, a project, a department, or similar that involves collaboration and dialogue) requires that you know your framework, and your rhythm. This is the second part of a two-piece blog post about modern people leadership, about the rhythm and daily mechanisms of modern people leadership. 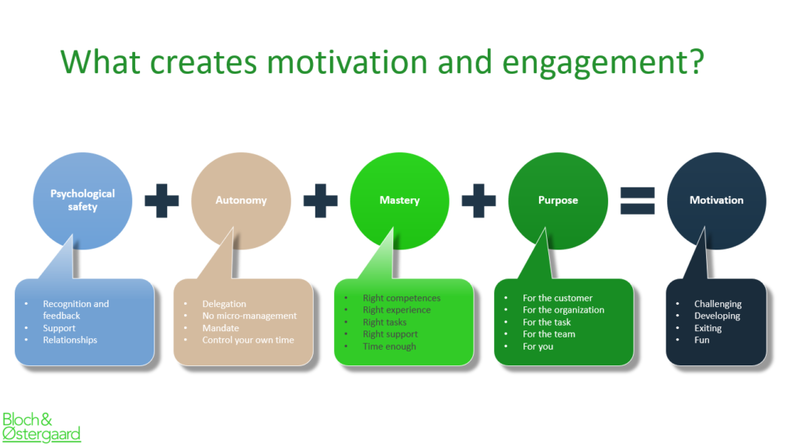 The first part described the frame for your work and collaboration. Once you have the framework and foundation of your team (or business unit or organization) in place, you should start paying attention to the daily and weekly cadence and maintenance of the team. This includes both people and progress and products. In contrast to the establishment and formulation of the frame (which includes four distinct and well-scoped questions), the operationalization of the frame is not at all something you can address bit-by-bit in a formula. How can we ensure, that we do the right things right? How can we create shared values and norms? How can we create shared and mutual responsibility? How can we create frequent and useful feedback? 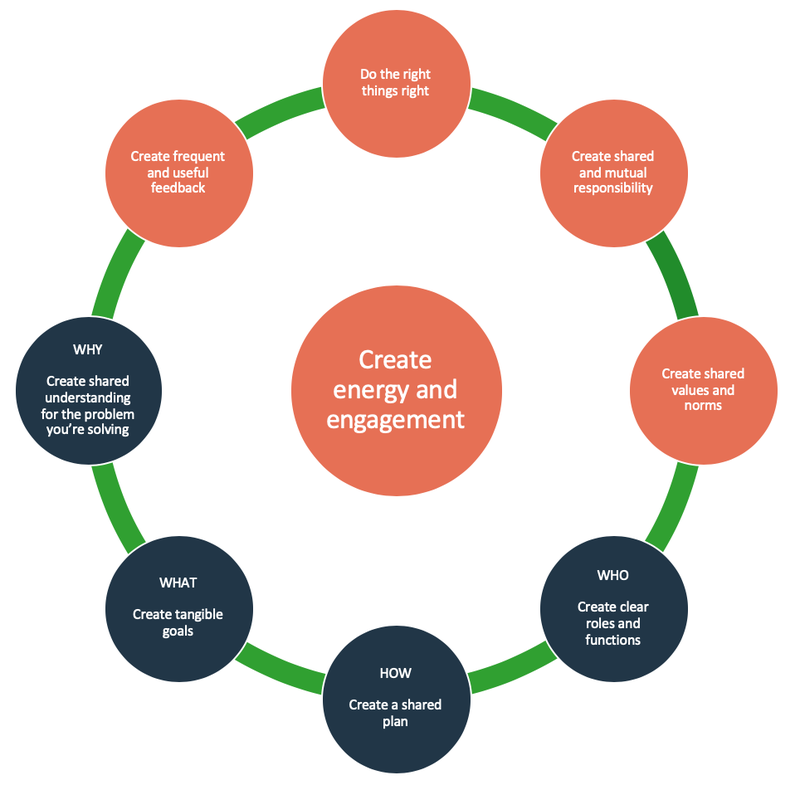 How can we create energy and engagement? From our experiences, the solution is to create a rhythm (or cadence) in your team with a higher frequency than in the old days, and with psychological safety to discuss relationships and results. 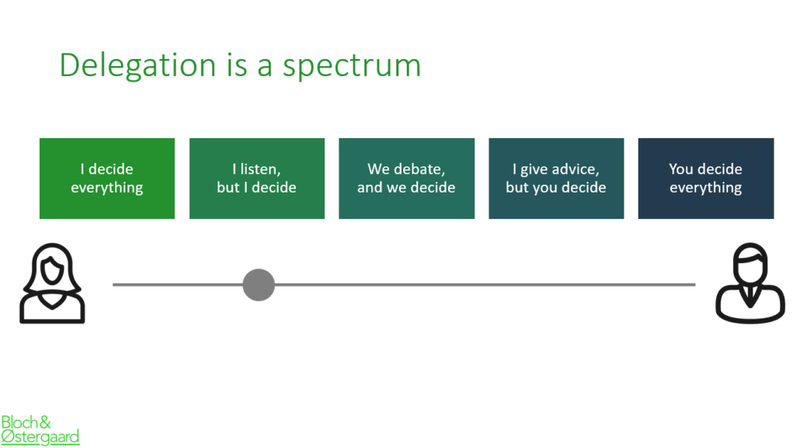 The main point is to create CONVERSATIONS across the organization. Yes, a hat-tip to Ira and George Gershwin. But this is crucial to modern leadership, and a vital sign of your success: How often do you touch base with your team, your colleagues, and your leaders around you? Daily? Weekly? Bi-weekly? Rarely? I believe it’s all about frequent touchpoints, and debating the right things, namely relationships and results (studies show, that these two things create happiness at work). I’m a huge fan of introducing elements from the Agile and Scrum world into the maintenance and growth of teams, business units, and organizations. Especially on C-level it has proved unusually powerful for the transparency and alignment of activities and approaches. See the case from Danske Bank in my book “The Responsive Leader“. Meet in front of the Kanban board with a suiting frequency. I prefer and recommend weekly meetings for C-level groups. Make sure, that all the activities you identify and initiate support your direction/purpose/mission of your work. Make sure, that you stop or adjust those activities, that do not. Make sure, that you monitor both the activities that are ON the business and IN the business, and use the innovation matrix to map the risk and identify speedboats. 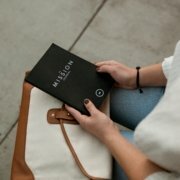 Are you doing the things right? What are your norms? Have you ever REALLY talked about expectations to your behavior? I’m not only talking about having a shared set of values, but also on agreeing on what good behavior looks like. What behavior do you expect? What behavior will you not allow? And how can you debate situations, where you are in conflict or in doubt? 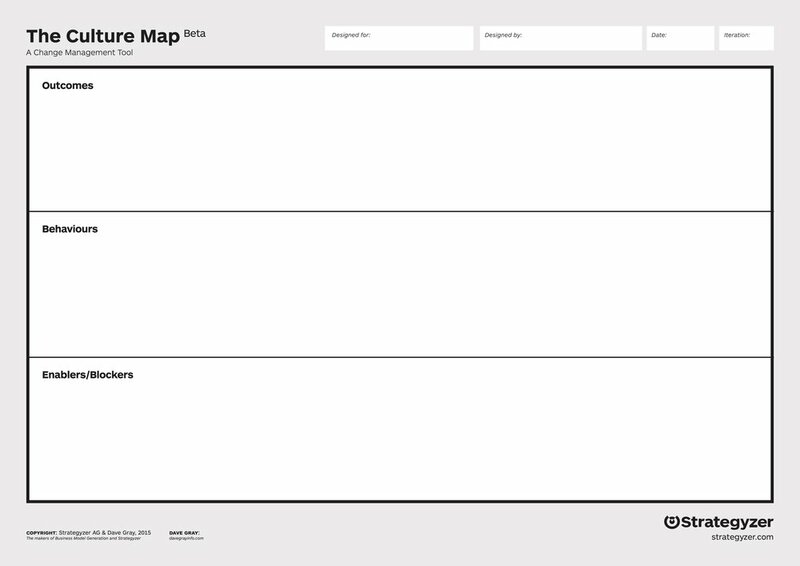 You might get inspired by the Culture Map by Strategyzer. We use it often. Once you have established what you are doing and how you expect each other to behave (feedforward), you are ready to establish feedback loops. Here are a few of our favorite mechanisms. 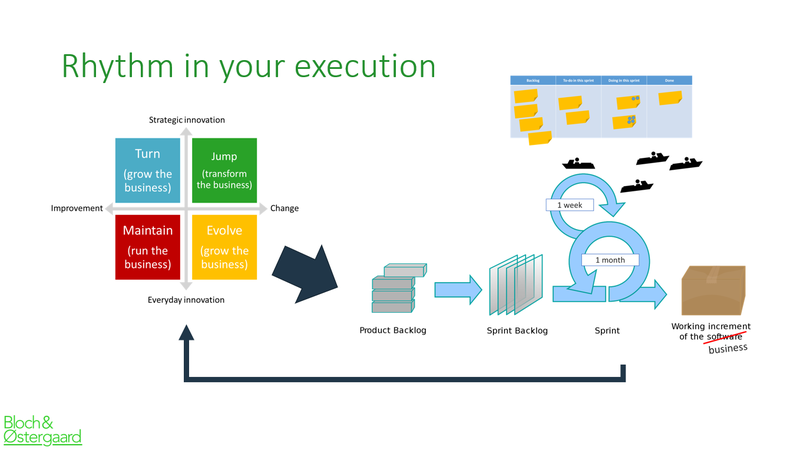 Inspired by Scrum, make sure to have (a) demo sessions, focusing on feedback on the products and services, you are delivering, and (b) retrospectives, focusing on feedback on your collaborations. From my experience, leadership teams are not used to reflecting on their internal collaboration, at all. Do that so often, that it becomes a natural habit to ask for and to give instant feedback to each other. Have weekly team meetings with your team, where you focus on purpose, people, progress, and profit – in that order. How happy are you with your relationships? How happy are you with your workload? We gather the data every Friday, and debate the overall result in public to share good stories and smiles, and to address things that are challenging too. Have bi-weekly 1-on-1 conversations with your employees. Make sure to be open and honest. Share experiences often, both successes and mistakes, to create learning. Be a responsible leader and make sure to follow-up and follow-through. Make sure to have a good and delicate dialogue around what creates stress at work, and know how to handle it. Crucial to shared responsibility is to be able do delegate in a healthy and professional manner, taking into account differences in each others experience, personal profiles, motivation, and preference in the Forming-Norming-Storming-Performing model. You can delegate both responsibility and tasks. And make sure to have an agreement on who has the actual decision mandate, you or the employee. One tool to facilitate the debate is the Delegation Poker game by Management 3.0. 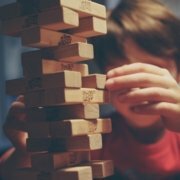 We describe the tool in this podcast episode, “Distribueret lederskab, en fundamental del af fremtidens lederskab” (in Danish). Make sure to agree on how and how often you meet and touch base with each other during the work. Daily? Weekly? Finally, make sure that you understand, that you need each other. There is a reason for you being a part of the team, and your mutual success relies on each of your work and well-being. This is the ultimate argument for rhythm and cadence: By mastering the mechanisms that are suitable for you and your team – e.g. like the ones above – you have the best possibility to create energy and engagement. 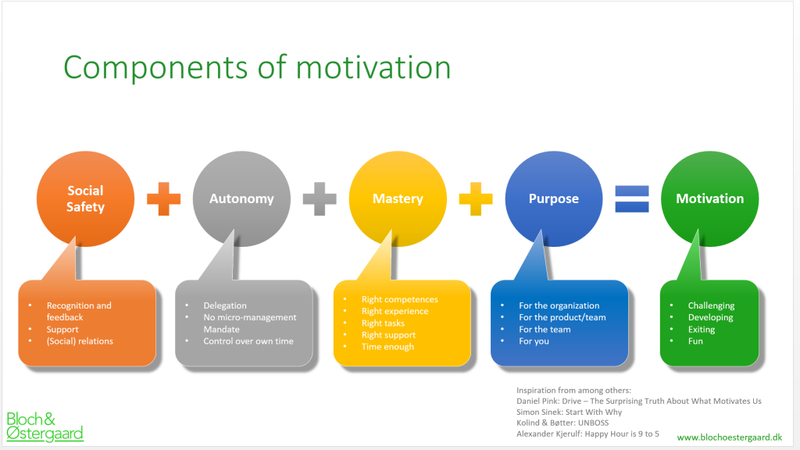 Engagement and motivation comes from mastery, autonomy, and purpose, according to Daniel Pink. Add to that psychological safety, and you have a culture of well-being. From my experience, a higher frequency of conversation and touchpoints is the key to creating the right culture, and the low hanging fruit of modern leadership. As a positive side effect, you get the possibility to train and sharpen your leadership skills on everyday basis, something we address in this podcast episode too, “Hønen eller ægget“.